Harriet Baskas (with distance wheel) and Nancy Castles of Los Angeles World Airports, after we walked the distance at LAX. My June At the Airport column on USA TODAY is all about the longest distances – between gates at airports. Figuring this out was no easy task. Many airports have those measurements handy and are happy to share them. Some airports claimed they couldn’t figure that out. A few balked – even refused – to answer. But one hearty staffer at LAX actually joined me – and my new distance wheel – for a hike through the terminals. There most definitely are some very long distances you may need to trek between connecting gates at some airports, but in most cases, there are motorized carts, wheelchairs, moving walkways and other assistance available to help out if walking isn’t your thing. You can see the full list of the longest gate-to-gate distances I gathered in the full column, but here are a few. The longest walkable concourse at Denver International Airport is Concourse B, which is 3,300 feet long. Heading from there to other concourses requires hopping on a train. At Seattle-Tacoma International Airport, a walk from the far end of the A Concourse, across the central terminal and out to the end of the D Concourse tallies to 3,885 feet, or about .7 miles. 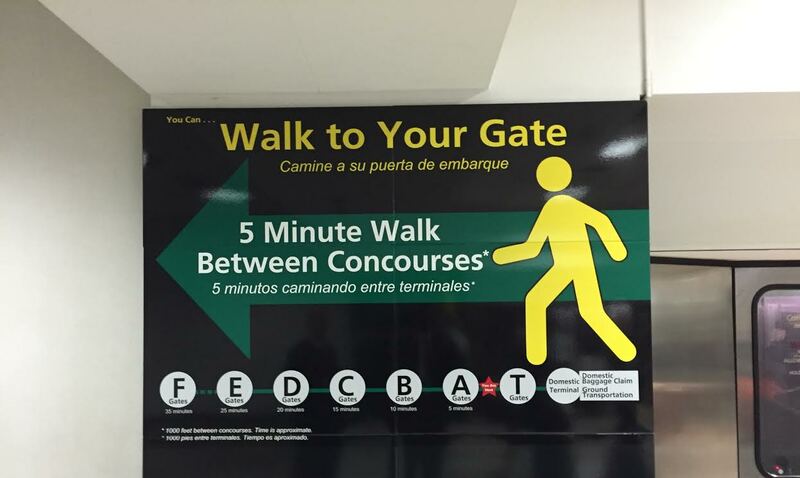 The longest walk between gates at San Francisco International Airport would be from the end of Terminal 2 (Gate 55) to the end of the International Terminal, Boarding Area G (Gate 101). It’s slightly more than 3/4 of a mile – 4,068 feet – between the farthest point of the A gates (Gate A-12) to the farthest points of the C gates (Gate C-8) at McCarran International Airport in Las Vegas. At Minneapolis-St. Paul International Airport, the furthest walkable distance between gates is in Terminal 1 and is approximately 5,700 feet, or about 1.08 miles. According to the brochure for the PHX Fitness Trail at Phoenix Sky Harbor International Airport, it is almost a mile (5,222 feet) between Gate A30 and Gate D8 in Terminal 4, the airport’s largest terminal. At Los Angeles International Airport, where public relations director Nancy Castles walked with me from the southernmost gate (Gate 159) in the Tom Bradley International Terminal (TBIT) to Gate 88 in United Airlines Terminal 8, my distance wheel clocked 6,433 feet, or about 1.2 miles. Along the way one dad mistook my measuring wheel for a cane and quietly instructed his children to “make way for that blind lady.” And a TSA officer wanted to borrow the wheel to measure the distance from the checkpoint to the nearest restroom, so he could truthfully answer a question passengers often ask. At Philadelphia International Airport, the longest route on the secure side is between Gate A26 in Terminal A-West to E12 in Terminal E, a distance of 5,838 feet, or about 1.1 miles. You can also walk from Gate A-26 to Gate F-39 in Terminal F – a distance of 7.072 feet, or 1.34 miles – but that requires rescreening at the security checkpoint. The longest interior walking distance at Dallas/Fort Worth International Airport goes from Gate D6 (Terminal D) to Gate A8 (Terminal A), a distance DFW officials measured at 1.45 miles, using Google Maps. And at Hartsfield-Jackson Atlanta International Airport (ATL), the walking distance from the beginning of the domestic terminal to the international terminal gates is about 10,600 feet, just a smidge over 2 miles. Did I miss a particularly long airport walk? Share the measurement below.